All belts available with Velcro lining to mate with Ultra and Loop Back Inner Duty Belts; nylon web model also available without Velcro. Very nice belt and adjustable so everything fits just fine, Thank You. The belt I needed all along. Very stiff, good for a large radio and key clips. Excellent product and is standard issue for our department. Strong and well made belt, very happy with it. This Gear is of outstanding quality and durability for police work. Very nice durable duty belt brand new also came with a clip to hang the belt in the closet in a straight vertical manner good quality. This is not my first uncle mikes duty belt. 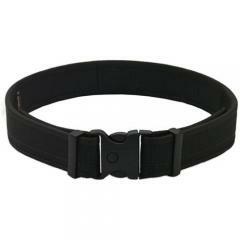 This belt is great for law enforcement and I will continue to buy these belts in the future.